A manuscript will be reviewed for possible publication with the understanding that it is being submitted to Indian Journal of Health Sciences and Biomedical Research KLEU alone at that point in time and has not been published anywhere, simultaneously submitted, or already accepted for publication elsewhere. The journal expects that authors would authorize one of them to correspond with the Journal for all matters related to the manuscript. All manuscripts received are duly acknowledged. On submission, editors review all submitted manuscripts initially for suitability for formal review. Manuscripts with insufficient originality, serious scientific or technical flaws, or lack of a significant message are rejected before proceeding for formal peer-review. Manuscripts that are unlikely to be of interest to the Indian Journal of Health Sciences and Biomedical Research KLEU readers are also liable to be rejected at this stage itself. Manuscripts that are found suitable for publication in Indian Journal of Health Sciences and Biomedical Research KLEU are sent to two or more expert reviewers. During submission, the contributor is requested to provide names of two or three qualified reviewers who have had experience in the subject of the submitted manuscript, but this is not mandatory. The reviewers should not be affiliated with the same institutes as the contributor/s. However, the selection of these reviewers is at the sole discretion of the editor. The journal follows a double-blind review process, wherein the reviewers and authors are unaware of each other’s identity. Every manuscript is also assigned to a member of the editorial team, who based on the comments from the reviewers takes a final decision on the manuscript. The comments and suggestions (acceptance/ rejection/ amendments in manuscript) received from reviewers are conveyed to the corresponding author. If required, the author is requested to provide a point by point response to reviewers’ comments and submit a revised version of the manuscript. This process is repeated till reviewers and editors are satisfied with the manuscript. Indian Journal of Health Sciences and Biomedical Research KLEU favors registration of clinical trials and is a signatory to the Statement on publishing clinical trials in Indian biomedical journals. Indian Journal of Health Sciences and Biomedical Research KLEU would publish clinical trials that have been registered with a clinical trial registry that allows free online access to public. Registration in the following trial registers is acceptable: http://www.ctri.in/; http://www.actr.org.au/; http://www.clinicaltrials.gov/; http://isrctn.org/; http://www.trialregister.nl/trialreg/index.asp; and http://www.umin.ac.jp/ctr. This is applicable to clinical trials that have begun enrollment of subjects in or after June 2008. Clinical trials that have commenced enrollment of subjects prior to June 2008 would be considered for publication in Indian Journal of Health Sciences and Biomedical Research KLEU only if they have been registered retrospectively with clinical trial registry that allows unhindered online access to public without charging any fees. Contributors’ form / copyright transfer form can be submitted online from the authors’ area on http://www.journalonweb.com. Manuscripts must be prepared in accordance with "Uniform requirements for Manuscripts submitted to Biomedical Journals" developed by the International Committee of Medical Journal Editors (October 2008). The uniform requirements and specific requirement of Indian Journal of Health Sciences and Biomedical Research KLEU are summarized below. Before submitting a manuscript, contributors are requested to check for the latest instructions available. Instructions are also available from the website of the journal (http://www.ijournalhs.org) and from the manuscript submission site http://www.journalonweb.com). 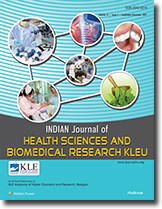 Indian Journal of Health Sciences and Biomedical Research KLEU accepts manuscripts written in American English. The entire contents of the Indian Journal of Health Sciences and Biomedical Research KLEU are protected under Indian and international copyrights. The Journal, however, grants to all users a free, irrevocable, worldwide, perpetual right of access to, and a license to copy, use, distribute, perform and display the work publicly and to make and distribute derivative works in any digital medium for any reasonable non-commercial purpose, subject to proper attribution of authorship and ownership of the rights. The journal also grants the right to make small numbers of printed copies for their personal non-commercial use under Creative Commons Attribution-Noncommercial-Share Alike 4.0 Unported License.